It’s been nearly 20 years since my husband and I left home — the Canadian provinces of Nova Scotia and New Brunswick — for a life abroad. Looking back, there’s not much we miss. We feel more at home in the Netherlands than we do when returning to Canada but we still retain touches of our upbringing, mostly through our love of certain foods. Our pantry is, for example, always stocked with good quality maple syrup from our family’s own sugar woods in Nova Scotia because all maple syrup sold in the Netherlands seems desperately sub-standard to us. Most recently, our Canadian roots showed up in the form of a craving for bread and butter pickles. 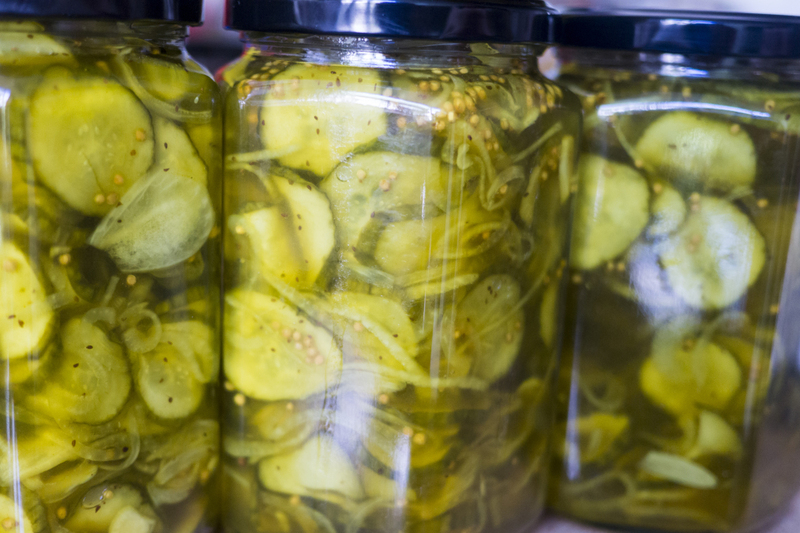 Bread and butter pickles take us right back to our Maritime roots. These sweet and sour pickles were a staple on both of our grandmother’s dinner tables and we can’t buy anything like them here. Time to get to work in the kitchen! We asked several friends back home to send their recipes and surprisingly they all forwarded nearly exactly the same recipe. The result took us straight back to our grandmother’s Sunday dinner table. Bliss! Combine the cucumbers, onions, salt and any of the optional additional ingredients (we added 3 cloves sliced garlic). Let stand 3 hours and then drain. Do not rinse. In a large pot, mix the vinegar, mustard seed, turmeric, celery seed and sugar. Add the vegetables and bring just to a boil. Pack in hot, sterilised bottles. Seal and store in a cool place for 1 month before using. Without water bath processing, the pickles should last 6-9 months. You could water bath process the pickles to increase their shelf life but this will also make them less crisp.